Options: Step with PVC HandrailsStep with PVC Handrails & 4'x5' Pad (+ $70)Step with Stainless Steel Handrails (+ $130)Step with Stainless Steel Handrails & Pad (+ $200) This item is out of temporarily out of stock. Contact us for shipping date. Our new deluxe in-ground swimming pool step is the perfect addition for any inground pool built without steps. These rugged steps are made from U.V. protected polyethylene to resist the harmful rays of the sun for years and years. 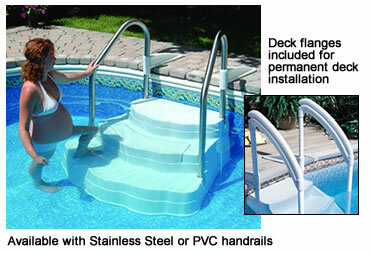 The redesigned step has a 33” height so it is the perfect height for any inground pool with a 42” sidewall. The new detachable step can be removed, filled with sand, and reattached to the step for ballast. No more awkward sand bags! Installation and removal of this step is simple and quick. Extra deep 10” steps are non-skid for safety. The steps measure 33” high x 53” wide and 45” deep. 400 lb weight capacity. Make entering and leaving your pool a breeze this season with our Executive in-ground step. Use the optional 4’ x 5’ step pad to protect your pool liner from premature wear. Click here for the swimming pool ladder assembly and installation instructions.